As many of you may or may not know, I reached my bandwith on this site two years ago and have been unable to load any new content. As a result, I started another site through another hosting company...with less success at www.helloliteracy.weebly.com. I still maintain this domain name and host this site for everyone that checks it on a regular basis. I still get lots of emails from teachers expressing gratitude for this site, so it's for you that I continue to host it. Due to google switching site platforms from Google Pages to Google Sites, I am unable to fix the broken links within the site, and for that I am sorry. However, please glide your mouse over my newest "hello" project, a blog, at www.helloliteracy.blogspot.com. While searching for examples of captions online, I stumbled across a great visual resource on the Stenhouse website (the publisher of many of my favorite literacy books) for the book called Ladybugs, Tornadoes and Swirling Galaxies by Brad Buhrow and Anne Upczak Garcia. Check out these pictures of student examples from their classrooms in this online photo gallery. Click here, then scroll down for ready made templates and pictures with elkonin boxes. There are four sheets already made, and more you can make on your own. 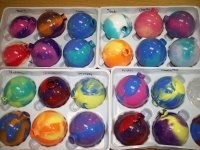 The ornaments are VERY easy. You need a class set of clear glass balls, on sale at Michael's right now, (save plastic holders that they come in) most years the room parent will pay or pay part. The acryllic paint in bottles works best. Combining only 2 colors (more than that and it all turns muddy brown or gray), ask students which two colors they want and then pour, for example, a bit of yellow in the 12:00 and 6:00 opening of the inside of the ball, then pink into the 3:00 and 9:00 opening of the inside. Tell them to hold the balls and gently turn them up and around (not upside down) to swirl paint around and together inside the ball. Let them sit in plastic tray overnight, drain excess paint completely before wrapping them up. (I've never had a child break them in the making process). I found this new website last week when seaching the internet for something, and normally I preach that I am not a worksheet teacher, but this website allows you to create differentiated worksheets based on ability for the same skill - which I love. Check it out! If you're a teacher that uses an LCD projector in your classroom, and use an overhead countdown timer, this is the same thing, and free. Try it, it's easy. Great for presentations and workshops! Found this on the Internet today - we don't use GEMS science kits, but the topics are very similiar to FOSS and Carolina Science. 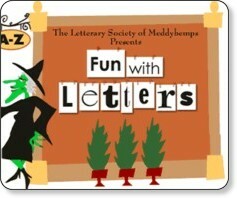 Fun with Letters was voted the 3rd best phonics website on the Internet by the Int. Reading Assoc. Check it out. Or, click here to read IRA article about phonics websites. It takes a minute or two to load, but it's streaming video of SAG actors reading children's literature. There are great downloadable pdf activity guide to go with each story. Check it out! I have absolutely no problem with you downloading, using and reproducing documents I have created and published on my website for use in your classroom. If you have a website, and use a document, link to a document or use it to get ideas to create your own document, give credit to the creator of the document and the site of the original source. If you, however, "copy" or "borrow" a document created by someone else, and call it your own, that's plagiarism. Posted 11.1.07 - As we begin the strategy instruction for Visualizing and follow the Debbie Miller book, she refers to the poems from Charlotte Zolotow's book, Snippets, but the book is out of print. I wrote to Charlotte last year and her granddaughter wrote me back and told me how to get a copy of it. However, I have re-typed the four poems here that Debbie uses with her class. The link in on the Literacy page or you can click here. Click here to view the free products I just ordered from Vista Print. There are usually 5-6 free products each month, all you pay is shipping. It's a great deal and they are professional. You, too, can convert any document to a pdf yourself, free, without buying an adobe writer program. If you don't mind a 5 second ad, that's all there is to it. Free to download at pdf995. You need to download both the free pdf995 Printer Driver and the free Converter, takes about 2 minutes. Have fun pdf-ing away! Most of the clipart used on my site is from www.pccrafter.com. They do have freebies, including the cute bugs at the top of this page, so check it out and grab some of this Lollie and Friends clipart for yourself, or join the clipart club and download tons of cute stuff for about $5.00 a month.